Welcome to Dublin Bird Pest Control - specialists in Pigeon and Bird Pest Control operating across Dublin and Leinster. We are available for call-out 7 days a week from 9 a.m. to 6 p.m.
We can trap and remove birds from your premises or residence, are fully insured and can provided documentation as requried. Often referred to as "rats with wings", feral pigeons have become just as much of a problem in towns and cities as their rodent, four-legged counterparts. Descendants of rock doves, originally cliff dwelling birds, the feral pigeon has adapted well to living alongside humans and is an integral feature of town centres across the country. Pigeons have been known to carry diseases such as Chiamdiosis, a virus similar to influenza, and Psittacosis, similar to pneumonia. Pigeons prefer grains for food and people will commonly feed pigeons unintentionally by spilling food or leaving it in open trash containers. Pigeons roost in areas above ground and will readily nest in steeples, as well as voids on outside areas of buildings and other protected areas. Pigeons are dependent on humans to provide them with food, roosting and nesting sites. They are commonly found around agricultural areas as well as warehouses, feed mills, and grain elevators. They are also commonly found in cities around parks, buildings, bridges, and many other structures. 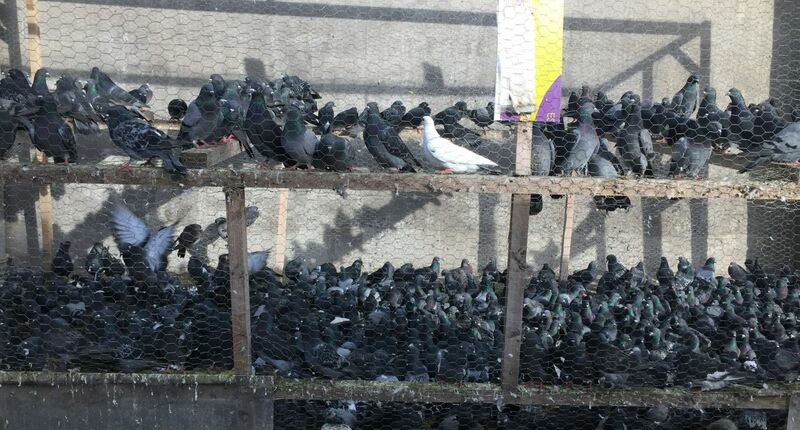 Pigeons are filthy birds, causing disease and damage. Their droppings are known for causing human slips and falls, as well as accelerating the aging of structures and statues. This makes it imperative to get rid of pigeons in highly trafficked areas. More seriously, pigeons may carry diseases such as cryptococcosis, toxoplasmosis, salmonella, food poisoning, and more. Also, their droppings may harbor the growth of fungus, which causes histoplasmosis. Other pests may live on these birds, including fleas, lice, mites, ticks, and other pests. 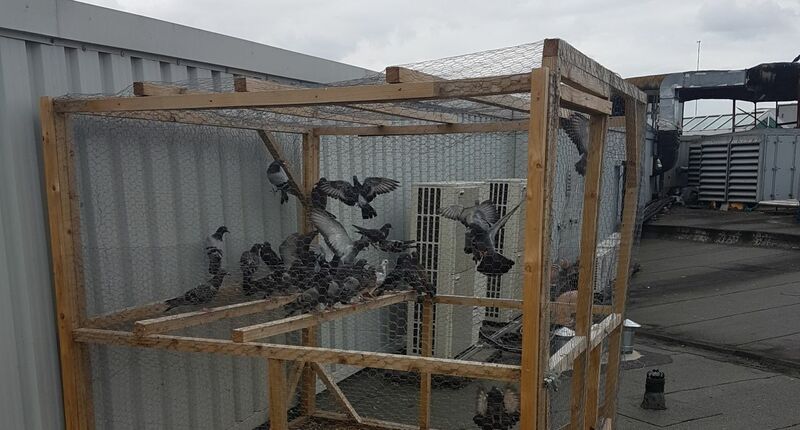 If you discover pigeons roosting on your property, you should contact us immediately to discuss a proper course of pigeon control. To prevent or get rid of pigeons, homeowners need to make roosting and nesting areas inhospitable. For proper pigeon control, fill in access to voids, and remove or inhibit resting areas. Keep all food and standing water out of reach of pigeons. At Dublin Bird Pest Control we recognise the fact that bird pests pose an environmental problem and therefore our approach is to treat the problem in situ, and not allow it to move on and manifest elsewhere. Where possible, we build bespoke traps for each unique situation where pigeon pest control is required. Our methodology is to trap the birds first, and then cull and incinerate the waste to prevent the further spread of disease. We can clear Office Blocks, Shopping Centres, Appartment Blocks, Factories, Stadia, Train Stations and Bus Depots. No matter what the situation, we can evaluate and propose a solution to eliminate the problem. Dealing with a Pigeon pest problem swiftly and concisely can save on medical bills for staff and help to reduce cleaning bills for your premises. We have a proven track record with our clients in pest control. We are fully insured, and can provide risk statements and safety statements as appropriate. We can also provide documentation for incineration of waste on request.